we develop powerful tools for the Web Age. 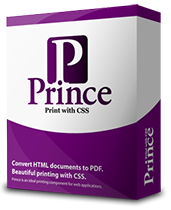 Our flagship product is Prince, the ground-breaking HTML to PDF formatter that sets new standards for print on the web. We needed a better support forum, so we made one. It turned out great, and you can use it too. Copyright © 2002–2013 YesLogic Pty. Ltd.